This year's twentieth anniversary of Ebertfest (Roger Ebert's Film Festival), our annual festival in conjunction with the University of Illinois, College of Media, at the Virginia Theater, will be dedicated to its namesake and co-founder, Roger Ebert, and to our cherished friend, Mary Frances Fagan, who loved movies. For 23 years, Mary Frances was a spokeswoman for American Airlines whose generosity as a sponsor enabled us to bring international guests to our festival right from its earliest days in Champaign, Illinois. Filmmakers such as Haifaa al-Mansour, Paul Cox, Ann Hui, Guy Maddin, Barbet Schroeder, Anant Singh, Bertrand Tavernier and Joachim Trier, as well as actors including Heloise Godet, Isabelle Huppert, Bill Nighy, Alan Rickman, Timothy Spall and Tilda Swinton are just a few of the guests whose presence at the festival was made possible because of Mary Frances and American Airlines. 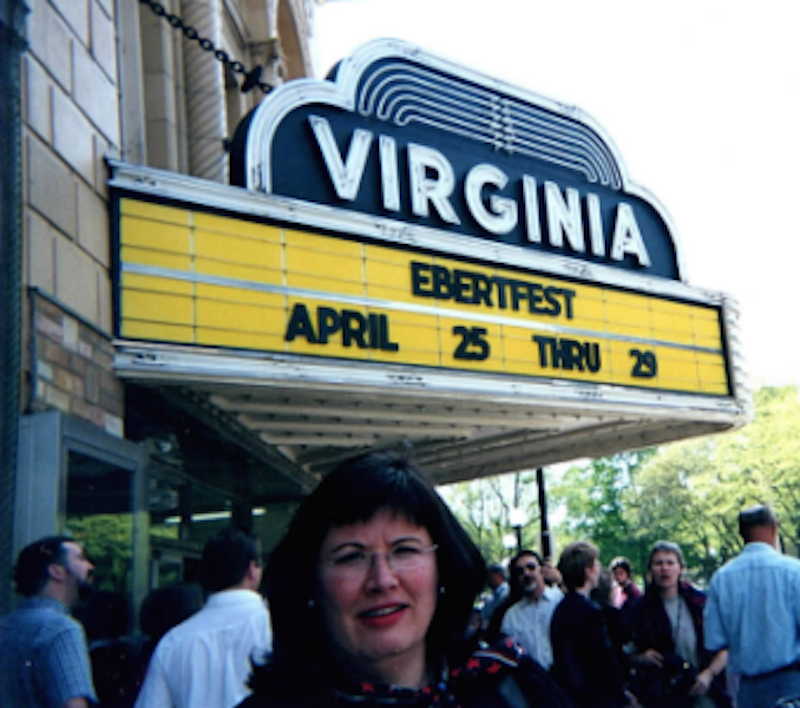 Without her contributions, Ebertfest could have remained a local festival rather than one with an international reputation. Roger referred to Mary Frances as Ebertfest's "guardian angel," and she will continue to be for as long as our movies continue to flicker on the gorgeous screen of the Virginia Theatre. Like Roger, Mary Frances was an alum of the University of Illinois, and contributed immeasurably to its legacy well after her graduation. In a beautiful obituary penned by Maureen O'Donnell at the Chicago Sun-Times, friends and colleagues offer their remembrances, including former American Airlines CEO Robert Crandall, who told Mary Frances in a recent e-mail that she "helped forge the world's greatest airline." Mary Frances Fagan in front of the Ebertfest marquee. Nate Kohn, Ebertfest director, recalls fondly: "Like Roger and me, Mary Frances was a Champaign-Urbana native and that made for a special bond among us who shared memories of an idyllic small town childhood. Her dedication to the festival was absolute, and we knew we could always count on her. Even after she retired from American Airlines, she continued using her vast reservoir of contacts to help us bring in filmmakers from around the world. She even managed to tame the Icelandic volcano for us one year. I suspect the festival's Guardian Angel, as Roger called her, will still be watching over us. We will always feel her presence at the festival, especially in the green room where she entertained guests and sponsors as only she could." Mary Frances, or MOF as she was affectionately called, passed away this past Sunday morning, February 4, 2018, in Chicago, Illinois, surrounded by loving friends and family. Please join us in celebrating Roger and Mary Frances at Ebertfest 2018, which is slated to run from Wednesday, April 18th, through Sunday, April 22nd. Passes for the festival are available at the official sites of Ebertfest and its main venue, The Virginia Theatre, 203 W. Park Ave., Champaign, Ilinois. They can also be purchased by calling the theater box office at 217-356-9063. Passes cost $150 plus processing and cover every screening scheduled for the festival. Only 1,000 passes will be sold. Panel discussions and other related festival events are free and will be held at the Hyatt Hotel.